Are you in the market for orthodontic treatment but worried about highly visible metal consuming your face? Here at Fidel Dental Group, we are happy to provide Invisalign, a clear alternative to wearing conventional braces that consists of a series of translucent, removable aligner trays. We have two convenient office, one in Arlington, VA as and another in Washington, DC, as well as a spectacular set of team members who are split between our offices. It is our goal to cater to the individualized needs of our patients, through working on a personalized basis. We are always happy to speak with you over the phone or in person about the wide range of options we have to offer. When you think about orthodontic treatment, do you jump to the image of a child or teenager with an overpowering set of metal across their teeth? If so, you are similar to many other adults; but we have good news! Nowadays there is a great braces alternative that doesn’t involve any metal brackets or wires, but also gives you a straight smile, and it is called Invisalign. Invisalign has completely changed the game for many adults who want orthodontic treatment but decide against it because of the visual aspect. Invisalign is helping revolutionize the practice of orthodontics, as it is changing the way people are thinking about braces. As a dental practice that offers a comprehensive list of dental services including Arlington & DC cosmetic dentistry, we are proud to offer Invisalign treatment to those patients of ours wanting to achieve beautiful, healthy and happy smiles. Improved Oral Hygiene: Since aligners are removable, and you simply take them out when brushing & flossing, you don’t have to worry about food particles building up or getting stuck in your orthodontic appliance. Discreet Treatment: With Invisalign, you don’t need to worry about being self-conscious about the way your smile looks, as the aligners are virtually invisible! No Food Restrictions: Because the aligners are designed to be taken out while eating, you can say goodbye to food restrictions, and continue to eat all of your favorite foods while you are enduring treatment! 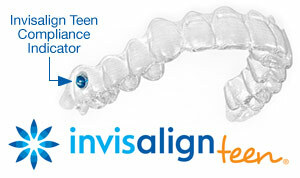 Optimal Comfort: Invisalign uses plastic instead of metal, so you don’t have to worry about any poking or irritation. Extra Protection Against Teeth Grinding: Patients with teeth grinding habits can reap extra benefits of Invisalign, since these aligners double as night guards to protect the teeth from excessive wear and tear. A lot of the time, Invisalign is an ideal option for not only adults, but teens as well who are looking to improve their smiles in a discreet way. If you would like to ask us any questions, or find out if you or your teemager is a good candidate for Invisalign treatment, please go ahead and schedule an appointment with us today. You may also contact us by phone at the following numbers: (703) 575-9899 (Arlington, VA), and (202) 362-7412 (Washington, DC). We would love to transform your smile into the one you’ve been dreaming about!